← Reading Room Log: Celebrate Talk Like a Pirate Day! Richard J. 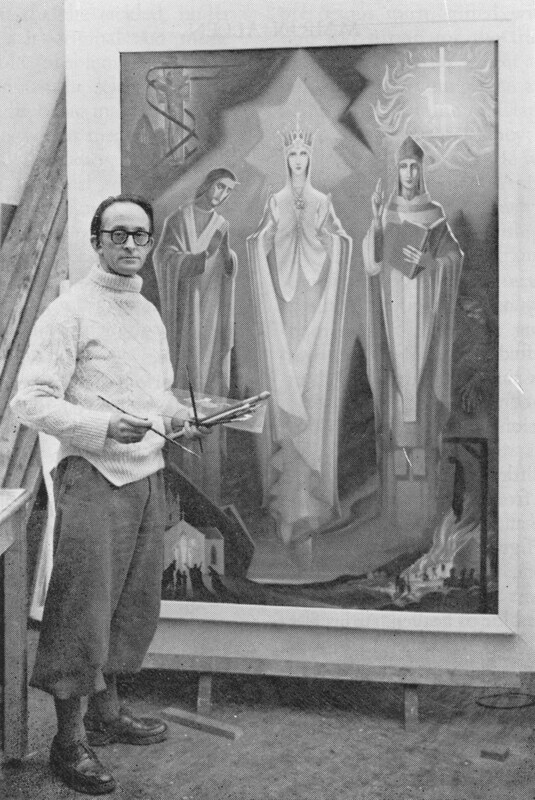 King in his studio, from the Capuchin Annual, 1975, p.169, AY64 .C2 Irish. Irish artist Richard J. 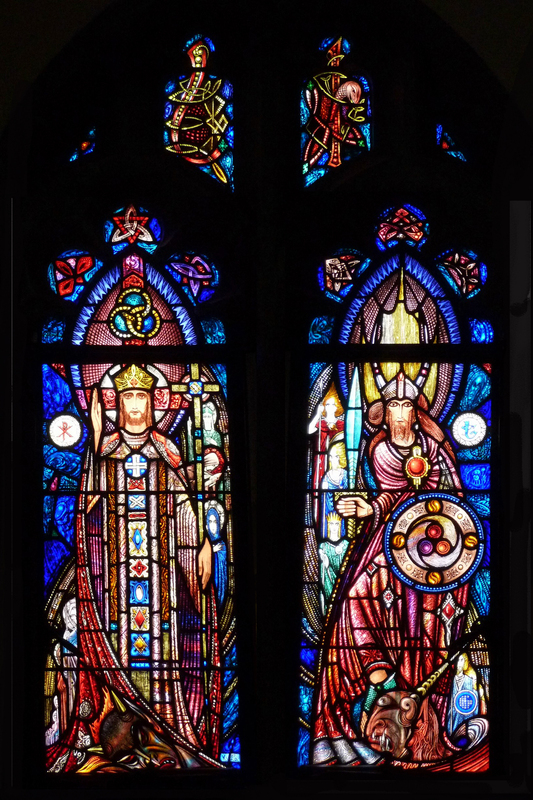 King (1907-1975) whose works encompassed subjects both secular and ecclesiastical is best known for designing stained-glass windows and for his management of the Dublin studio of world-renowned stained glass artist, Harry Clarke (1889-1931). King was born in the west of Ireland, in Castlebar, County Mayo. A lifelong friend once described him, saying “Richard showed great skill with his hands. His home was full of toys and gadgets of various kinds which displayed his precocious ingenuity and talent for improvisation.” In Dublin, where he moved with his family in 1926, he enrolled at the Dublin Metropolitan School of Art where his skill brought him to the attention of Harry Clarke. King entered Clarke’s firm in 1928. Upon Clarke’s death in 1931, King became the studio’s chief designer. He became manager of the firm in 1935 and remained until 1940, when he left to found his own studio. Photo showing two Richard J. King windows in the James Jeffrey Roche Room, Bapst Library, Boston College (as intended to be installed). Photo showing two Richard J. King windows in the James Jeffrey Roche Room, Bapst Library, Boston College (as actually installed). An interesting typewritten note within the papers of the Burns Library’s King Collection – perhaps written by a library staff member, but unsigned – asserts that at the time of the installation of the windows, Fr. Connolly changed the position of the panels in the two-light window, thus ruining the design since “the long robes of Lugh now, instead of carrying out the line of the design, cut it in half, and created opposition.” The King Collection also includes sketches by King of the proposed designs in which the placement of the two panels is indeed the reverse of the way they were installed. Whether the artist changed the plan prior to their installation, or whether Fr. Connolly in fact made the switch has not been discovered. 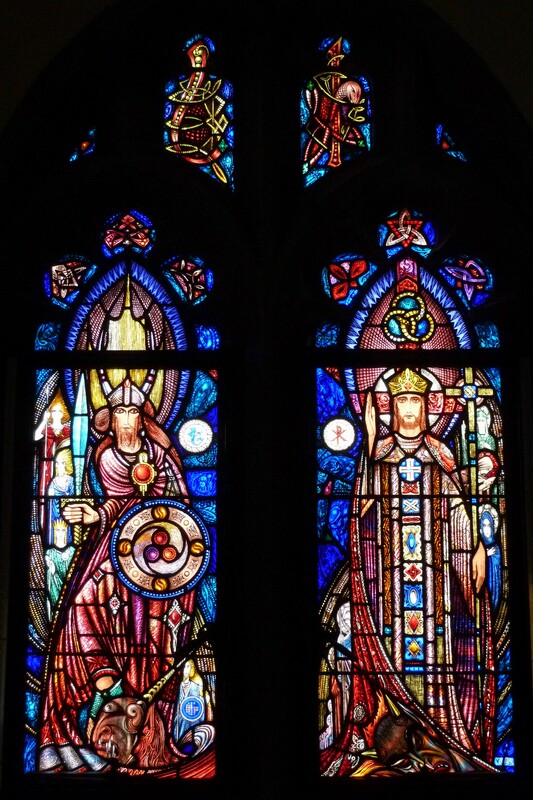 It is well worth visiting the Bapst Library to view the King windows – especially on a bright afternoon when the sun hits them most directly. The windows are located on the main floor, in a room to the left as one enters the Kresge Room. 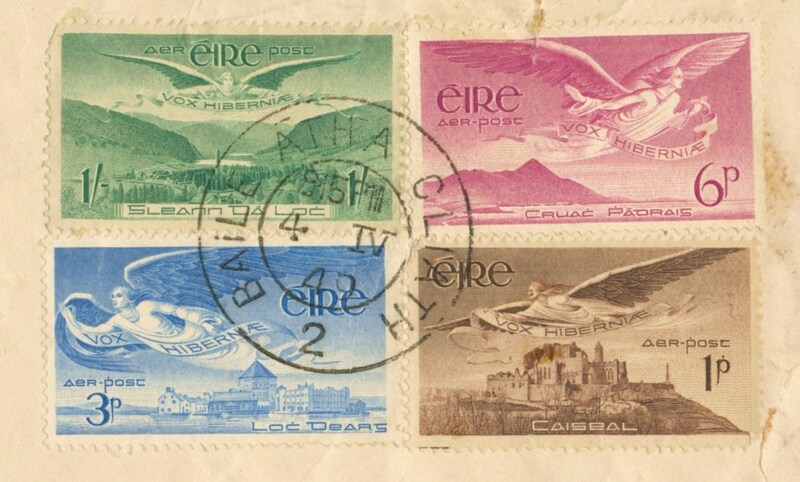 First day of issue cover of a series of four Irish airmail stamps designed by Richard J. King, April 4, 1949, Box 1, Folder 18, Richard J. King Collection, MS.2006.004, John J. Burns Library, Boston College. 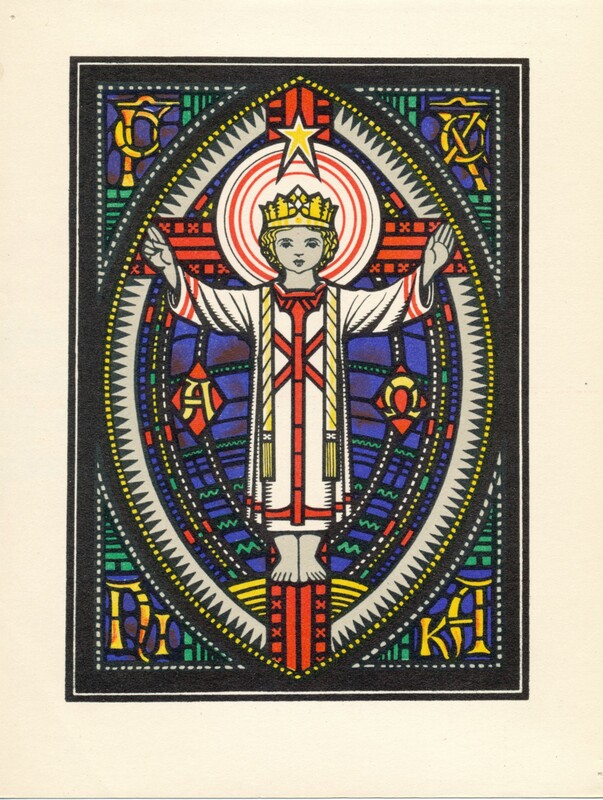 In addition to his work designing stained glass, numerous King illustrations were featured in the periodicals The Capuchin Annual and The Father Mathew Record during the 1940s and 50s. Between 1933 and 1949 King also designed twelve postage stamps for Ireland. Within the King Collection is a first-day-of-issue cover of four airmail stamps, sent by King to Boston College librarian Rev. Terence L. Connolly SJ in 1949. Examples of some of the other stamps which King designed, and proofs of some of their artwork, are included in the collection. In 1945 Victor Waddington Publications issued a set of twenty-six original Christmas cards, designed by King. Examples of many of the cards (and later reproductions of them) and copies of a selection of his periodical illustrations are also included in the collection. Christmas card, Box 1, Folder 19, Richard J. King Collection, MS.2006.004, John J. Burns Library, Boston College. Additionally, there are reproductions of other King works including series of Stations of the Cross, Catholic saints, and the Sacred Mysteries – all rendered in various aesthetic styles and artistic media. Paintings by King are represented in the Burns Library’s King holdings as well, by an oil portrait of Boston Pilot editor James Jeffrey Roche (1847-1908), and a watercolor of Roche’s birthplace, Mountmellick, Offalay, Ireland. To view the Richard J. King Collection, please contact the Burns Library Reading Room at burnsref@bc.edu or 617-552-4861. This entry was posted in Archives & Manuscripts, Art at the Burns Library, Staff Posts and tagged burns library richard king papers, irish room windows boston college, lugh balor stained glass boston college, richard king boston college, richard king john j. burns library, stained glass boston college. Bookmark the permalink. I live in Perth West Australia and have admired a Richard King Stained Glass Window in my Parish Church, since I joined the parish of “Our Lady Of the Most Blessed Sacrament”, in 1993.The window is dedicated to the late Archbishop Redmond Prendeville, former archbishop of Perth and was installed when the current church was built. I thought you should know that at least one of his works has reached the shores of our sunburnt land.